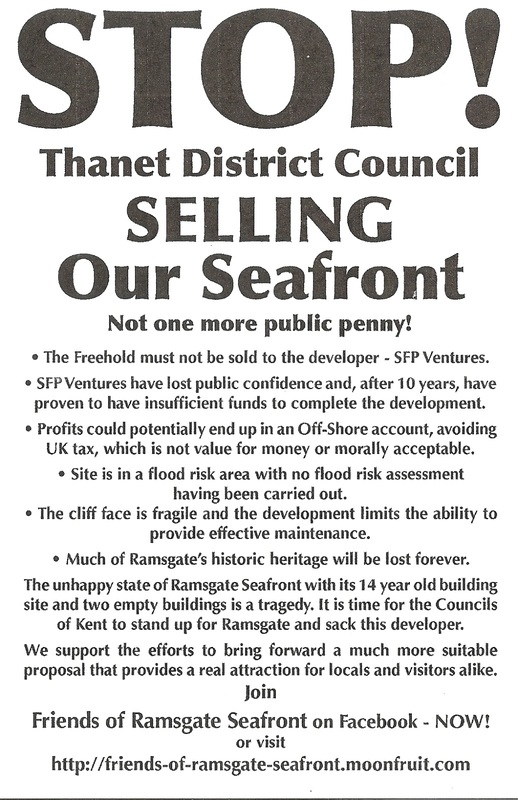 An interesting flyer on the Royal Sands development in Ramsgate in circulation as far as Westgate this weekend. Louise Oldfield has some detailed coverage on her weblog and so of course does Cllr David Green and the town's 'agent provocateur,' Michael Child, who has been worrying about flooding for as long as I can remember. All I would add is that if the Pleasurama site floods in a one in two hundred year storm, then so I gather, may Margate and Ramsgate, from the flood risk and engineering reports that were passed to me, when I last inquired. Quite what the legitimate tax affairs of any business have to do with the subject, much like the current Google and Starbucks controversy, I don't quite know. Tax avoidance is a matter for Government and not for a local council to determine but if the administration spent rather more time concentrating on important problems like Royal Sands, rather than being distracted by diversity and the vexing problem of gay giraffes, we might see a little more progress towards some kind of sensible, if not broadly acceptable resolution to a planning problem, which years after its inception, appears to have no end in sight. Lastly, a friendly word of advice to Clive Hart which I'm sure he knows makes sense. Please keep your deputy leader, Cllr Alan Poole away from television cameras, BBC radio cars and where possible, public meetings. If not for his own good, then for the reputation of your own administration and the Council. Update... Having just watched Cllr David Green on the BBC's Sunday Politics show, I'm reminded of a Punxsutawney Pete clip, in the movie, Groundhog Day, So as an act of political charity, please reconsider putting him in front of the camera again. Simon the level of the site is unchanged since 1860, the storm of 1897 demolished most of the buildings on the site, and the 1953 storm caused a 12ton crane that had been working on the beach to be thrown over the sea defence and into the middle of the site. Both of these incidents are well documented in the local papers, this is information I passed to you and published online when you were part of the Conservative cabinet that decided not to pull out of the development against officer advice. Do you have any documentation to justify your assertion that the site only floods once in 200 years? Perhaps you have more information than the 2008 EA letter strongly recommending a flood risk assessment and the confirmation of this provided to Roger Gale and Laura Sandys by senior EA officers both of which I have and passed on to you. When are the wheels going to fall off this most damaging of Labour administrations. It will take years to get back what little credibility TDC had. Poole, Green, Johnstone, Fenner and Hart, are a useless shower only there for the expenses and publicity, and unable to recognise their own incompetence. I could hope our Labour constituency associations will but forward more capable individuals next time round but I somehow doubt they will. This is of course if they exist beyond Poole, Green, Johnstone, Fenner and Hart. Michael.. round and round we go in somewhat obsessive circles. The advice I received at the time from officers, after multiple inquiries and FOI requests from you, was of course that the Cliff was sound. So let's not go down that that rather tedious road again. And for information, I'm pulling a 200 year flood from memory but I have very little doubt that you will continue to explore the subject, regardless of which administration is in control and will be doing so still long after I have left local politics. To be fair to Michael, if the development goes ahead, the EA is after a new flood risk assessment, which only makes sense and I would support this as a measure of simple common sense anyway. "All I would add is that if the Pleasurama site floods in a one in two hundred year storm, then so I gather, may Margate and Ramsgate, from the flood risk and engineering reports that were passed to me, when I last inquired"
What a bizarre comment. So, you are saying that an engineer has produced a report which suggests that flooding of the Pleasurama site will coincide with flooding of Ramsgate. I'm not an engineer but I don't think you need to be an engineer to see that Ramsgate is elevated well above the level of the Pleasurama site. Flooding at the level of the beach and harbour will not affect the town. Presumably, what the engineer meant is that some of the properties around the harbour might also suffer from flooding. Well, even if this is true I can't see what point you are making. The fact that over a hundred years ago, buildings were constructed in an area of high flood risk can hardly be used to justify further building in the same area. As recent experiences illustrate, buildings constructed in areas of high flood-risk must be constructed to withstand those floods. I would expect to see the building resting on foundations which have been pile-driven. I believe this was the original plan. I wish that you and Michael would kiss and make up. Can't you see that you are both on the same side of the fence. I'm working from recollection and informed professional opinion. If you don't like it then you don't have to accept it. Neither am I commenting in any official sense. I'm permitted to express my own opinions here and if for any reason I was sharing any 'official' position then I would say! Simon is showing signs of having been brainwashed by TDC experts. Get real Simon and stop being so trusting. If you seek professional advice on a subject it's quite normal to accept the results in contrast with asking an anonymous stranger on an obscure weblog for an opinion. Are you going to assist Ian Driver regarding Pleasurama, as he requests that you do so in his latest press release? Reading elsewhere, I suspect Peter's ability to read and then quote what I have said is somewhat limited! I think there is a bit of a misunderstanding here that there is some sort of enmity between me and Simon, I hold Simon in high regard and consider him to be one of the very best of our councillors. This doesn’t stop me from asking him questions and as yesterday the secret documents (cabinet pinks) on which the cabinet he was part of appeared on the internet and like it or no, most people with an interest in the matter will have read them. I understand that at the time Simon was a junior member of the cabinet and wouldn’t have had much influence on the way the decision went. But that said the documents were not at all convincing, one of the documents purporting to come from a Swiss bank has a Mickey Mouse element to the extent of being numerous. But as Simon was there and part of the main decision making process the previous Conservative administration made about something that has put a large economic blight on the town I live in and is on the seafront behind which I am currently trying to trade in an adverse economic climate. I feel that asking Simon how and why the previous administration could have proceeded with this development, against officer advice, given the documentation is reasonable. I would hope the record shows my own concerns at the time and more recently, drawing attention to those same irregularities that prompted Cllr Driver's involvement. That said, officer's advice is just that and Cabinet can and often does make decisions influenced by wider factors. In the example of Royal Sands, then in order for any project to proceed, then those same officers need to be able to reassure Cabinet that appropriate due diligence has been conducted. Working only from my memory, this evening, I recall the Council requiring a bond and and also the involvement of Nat West and Cardy. I think part of the problem here revolves around what the Council can and cannot legitimately take into account in a development of this size. The benefit of hindsight makes experts of us all and It may well be that concerns may be flagged about SFP were dded valid but if the company is able to partner, as it has, with guarantors of sufficient weight and credibility, then its not for any Council to act as some kind of international banking police force. Council's have a very narrow remit at the best of times and Royal Sands is an example of good intentions that fell victim to the downturn in the economy. Simon it isn’t my intention to hammer home all that was said at the time, the fundamental objection to my mind was then and is now councillors being supportive of a development that the EA says needs checks to ensure the life and limb safety of those living in it, without those check being made. However I think there comes a point where the councillors are seen to be supportive of investment that has a heavy environmental and safety downside. I think most serious investors are, in the first instance looking for a safe and healthy environment, whether this is for residential developments that they wish to let or to sell, or whether it is for their employees if they are considering locating their business here. 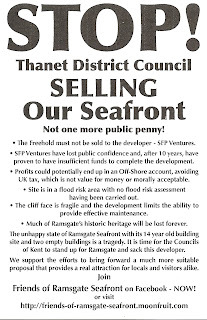 Somehow I don’t think the council being shown to have a lax attitude, say to a developer that wished to build without basic EA recommended safety checks would encourage other investors of the type that we want or need in Thanet. If you ever get the opportunity and know the right people get a qualified construction, engineer, geologist or architect to cast their eye over the whole project, cliff surveys, flood appraisals, site geology, sea defence, road layout, foundation work, plans and so on. Lots of it just doesn’t make sense given a building life of about 100 years, maintaining a 70ft high cliff face in a 12ft gap, foundations on sand held in place by an unknown sea defence, psv access down an 1870 viaduct constructed for horse drawn vehicles, a two way road for all access that is 12ft wide, well there is loads of it. You could even ask the council’s own building control for an off the record appraisal. You may then ask yourself, what say the engineers in a company considering locating here may have to say to management. Personally, I have no problem with an EA assessment and as you know, I have, from tme to time passed on your concerns for comment by the appropiate concil officers. Simon so having passed information along the lines of “your Titanic seems a bit short on the lifeboat front” or “your airship seems to be sagging in the middle” did you get anywhere. Incidentally, if you haven’t I recommend you read Nevil Shute’s biography “Slide Rule” it is an aviation book about the R100 and R101 and I think you would enjoy it. (1) Felixstowe has spent £20 million on upgrading flood defences. Wonder what their experts advised ? (2) "Legitimate tax affairs" is a begging the question fallacy as well as misconstruing the argument. Every council should have procedures for fulfilling obligations under Proceeds of Crime Act (Money laundering duties to report knowledge or suspicion). The point is that failure to follow the procedures is a measure of TDC lack of due diligence. If TDC was given £600,000 towards the cost of shoring back the cliff (you deem safe)the point was made that it was a necessary part of TDC due diligence to ensure the sum was accounted through the tax returns of the developer. Just as from the outset it was a necessary part of due diligence to verify authenticity of bnkers draft letters. (3) There is a chap in Suffolk called Roger Stearn. He was being told that Sizewell nuclear plant represented no risk to his farm in mid Suffolk miles away (Old Newton). So he took the council and nuclear industry assurances to insurers. Asking to insure against the consequences of a Sizewell nuclear leak. Asking to insure against the miniscule nigh non-existent (apparently) risk of a Sizewell safety failure. No insurer would touch it. I rather suspect that if you were to take your expert opinions, re the cliff face (which is not supported but merely face dressed, without footings, for retention)and your expert opinions re flood risk, that no insurer would touch it. (4) Whilst sitting on the EA flood risk fence as you are. If it is common sense to you to support EA wishes to carry out an assessment what do you think the consequences of such an assessment might be ? (5) You used the phrase "legitimate tax affairs". Did an expert advise you that the affairs are legitimate? I cannot see the harm in carrying out a flood risk asessment. The sea does have record of killing people. The existence of a flood risk assessment might aid the Defence in any future corporate manslaughter charge. 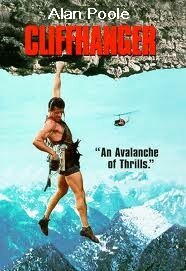 Work to the cliff face must of course take into account the sensibilities of any gay seagulls. Simon I guess the key question related to the documents for the 2009 cabinet meeting that have, rightly or wrongly now come into the public domain, is. Were the discrepancies in the documentation submitted to cabinet then influential in the decision to allow the developer an extension to 2017 and the associated variation to the development agreement? Because if this was the case, it cast doubts on the validity of the agreement and has a considerable effect on the council’s liability, in terms of the several million pounds the developer may claim if the council decides to terminate the agreement, which now seems a very real possibility. Can Michael please tell us where to find the 2009 doc's.